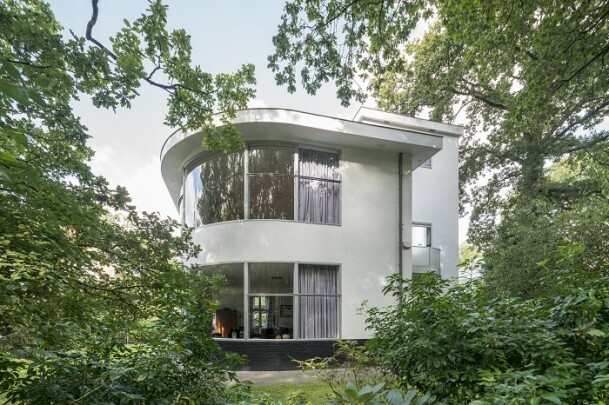 In the 1930s we find Rietveld designing a trio of houses in Benoordenhout, a villa district in The Hague. The Mees and Wyburg houses are variations on the theme of cube and cylinder. The circular portion in the Mees house combines a living room and music room; the roof functions as a terrace. The double-height circular volume in the Wyburg house contains a ground-floor living room and an upstairs study. The rectangular tower rising above the roof is glazed on the south side to deliver daylight to the stairs. For the Hillebrandt house Rietveld drew a barely visible gable roof to get the design past the vetting committee without undue delay. Its living room contains a raised area for music-making and dining.